In historic Chandler, you'll be welcomed by Arizona's first golf course with lush greens, a quaint downtown and more than 330 days of sunshine each year. Built in 1912, the historic San Marcos Golf Resort has been an integral part of Chandler's history, and we hope it will become a memorable part of yours. 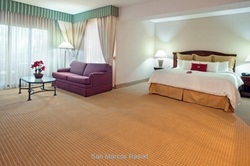 At the Crowne Plaza® San Marcos Golf Resort, any event you host can be a great one. This historic hotel in Chandler is "The Place to Meet," and the venue options consist of a large Pavilion, lush courtyards and elegant ballrooms. This resort is an idea reunion venue for either a banquet-style event of cocktail reception for groups ranging in size from 100-500. 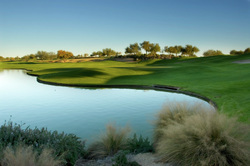 The resort host a fabulous golf course, tennis courts, lavish pools, restaurants and an elegant lounge. This resort is ideally located in the heart of Downtown Chandler home to many unique shops, fabulous restaurants and a wonderful performing arts center. Prices quoted below are all-inclusive pricing including all the Food listed including Taxes and Gratuities, Venue Rental fees, Professional DJ, Photographer, Class Website, Facebook Reunion Community Page, Classmate Name Badges, Door Prizes*, On-Site Reunion Coordinator, and much more. 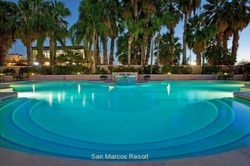 The San Marcos has gone all out to make your reunion the best ever. They're offering a fantastic cocktail style and banquet style menu at incredibly affordable prices. To start with, select 3 items from the following list: Spinach and Feta in Phyllo, Sonora Chicken Empanadas, Chicken Sate, Cashew Chicken Spring Rolls, Beef Mini Burrito, Beef Teriyaki Skewer, Apple Brie Tarlet, Smoked Salmon Canape', or Curry Chicken on a Cucumber Ring. Santa Fe Salad with Fresh Greens, Tomatoes, Scallions, Corn, Black Olives and Queso Fresco with Chipotle Ranch Dressing, Chicken And Beef Fajitas with Sour Cream, Salsa and Guacamole, Cheese Enchiladas, Spanish Rice, Refried Beans, TriColor Tortilla Chips, Chef's Choice of Dessert, Coffee and Tea Service.